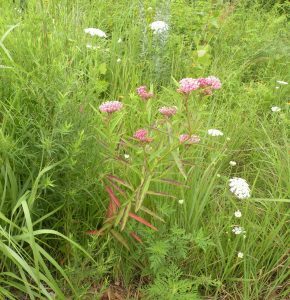 After reading an article by Amanda Thompson in one of the green industry magazines to which I subscribe, I feel the need to discuss what it means to grow native plants. 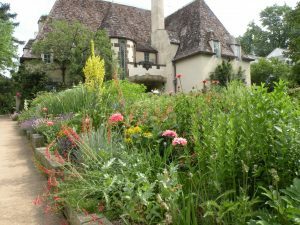 Growing native plants has many benefits. The two most commonly cited are that they have adapted to particular sites and that they have a symbiotic relationship with many insects and animals. However, they may not necessarily be the best choices for some design parameters. There is also a great deal of debate about exactly what a native is. I discussed this in great detail in my post of 2/5/16 entitled “Going Native”. What I did not discuss in that post was the effect that insects have on natives. You should also be aware that being a native does not mean that deer and rabbits won’t eat them. 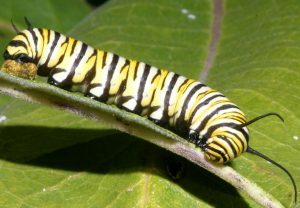 Using butterflies as an example, particularly since there is so much interest in resuscitating Monarch populations, it is important to understand a butterfly’s life cycle. 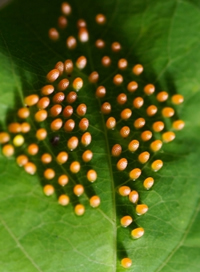 Stage one is the laying of minuscule eggs on leaves. 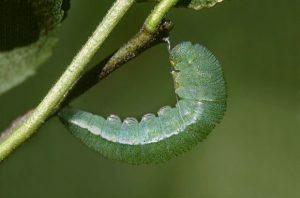 During stage two (hatching), what emerges from the egg is a caterpillar. The mother butterfly only lays her eggs on the type of leaf on which the caterpillar will be born and will eat; each caterpillar type likes only certain kinds of leaves. Caterpillars need to eat and eat so they can grow quickly. When born, they are extremely small but as they start eating, they instantly start growing and expanding. As soon as caterpillars reach their full length/weight, they form themselves into a pupa, the third stage. From the outside of the pupa, it looks as if the caterpillar may just be resting, but inside, the old body parts of the caterpillar are undergoing a remarkable transformation, called metamorphosis. Tissue, limbs and organs of a caterpillar have all been changed by the time the pupa is finished and are now ready for the final stage of a butterfly’s life cycle. The fourth and last stage is emergence. Usually within a three or four-hour period, the butterfly will master flying and will search for a mate in order to reproduce. Then the cycle begins again. I go into this much detail so that you understand growing native plants means that you will see eggs on the leaves, that you will encounter the caterpillars which will eat the leaves (sometimes leaving holes, sometimes decimating the leaves), and you will see the pupae hanging from stalks or branches. All of this means that you will “bugs” in your garden. Mine is a garden of diversity. I grow natives, nativars, and “exotics”, meaning I grow plants that are native to other areas of our country and to other countries but have similar zone hardiness and culture. I know that there is also a bemoaning of the decimation of bee populations but I will tell you that my garden is full of beneficial insects. I accept the fact that the plants in my garden may not look perfect but frankly, the garden is so crowded that I rarely notice the holes in the leaves. As long as you don’t need a garden that looks perfect, you will be happy growing natives while contributing to the environment.